Natural range Honshu (except for Aomori Pref., Sea of Japan side of Tohoku District, Hokuriku District, and around Wakasa Bay), Shikoku, Kyushu, and nothern and central Ryukyus. Habitat Lowland lakes and ponds, rice field, canals, and slow streams. Range in Japan Established in Hokkaido. DNA analyses suggested that artificial introduction also occur in Tonegawa, Arakawa, and Sakawagawa River Systems in Kanto to southern Tohoku District. Impact Hybridization with native population in except Hokkaido. Affected organism: Native Medaka populations. Introduced range in other countries Russia, Turkmenistan, Kazakhstan, Iran, Afghanistan, Hawaii, Cuba, etc. (O. latipes sensu lato). Asai et al. 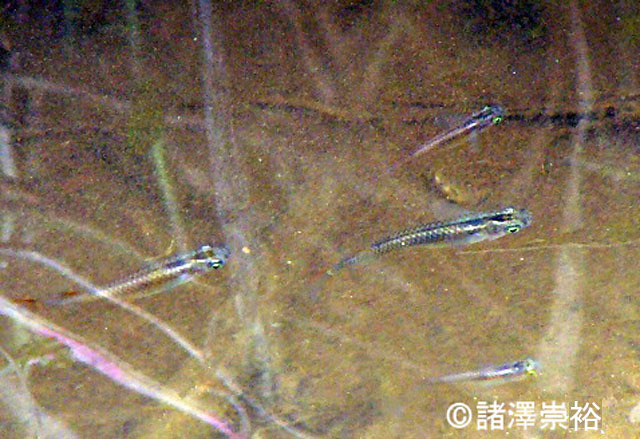 (2011) Oryzias sakaizumii, a new ricefish from northern Japan (Teleostei: Adrianichthyidae). Ichthyol Explor Freshwaters. 22(4), 289-299. The populations on the entire Japan, Korean Peninsula, continental China, and Taiwan were formerly placed in Oryzias latipes sensu lato. However, the strain of Aomori Pref., Sea of Japan side of Tohoku District, Hokuriku District, around Wakasa Bay, and northern Hyogo Pref. (“Northern Japan Populations”) were described as a new species O. sakaizumii in 2011. Accordingly, the remaining populations of O. latipes sensu lato were devided as follows: the populations on the remaining part of Japan was O. latipes sensu stricto; the populations of western Korea, continental China, and Taiwan was O. sinensis; and the populations of eastern and southern Korea may be an undescribed species or subspecies of O. sakaizumii. The non-native populations within Japan may belong to O. latipes sensu stricto. Those in Turkmenistan, Iran, Afghanistan, and Kazakhstan were from China, but the origins of those in the other countries were unknown.